DRDGold CEO Niël Pretorius discusses poor electricity infrastructure risk with Mining Weekly Online’s Martin Creamer. Video and video editing: Creamer Media’s Darlene Creamer. 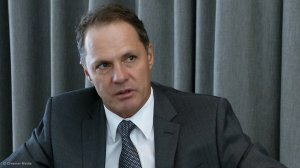 JOHANNESBURG (miningweekly.com) – The quality of maintenance of the Eskom distribution infrastructure is becoming increasingly problematic, DRDGold CEO Niël Pretorius said on Wednesday. At the company's presentation of power-hit interim results for the six months to December 31, Pretorius said that although DRDGold's own power infrastructure back-up has rendered the Ergo gold-from-tailings plant more resilient to Eskom power failures, the company was still unable to completely avoid the impact of very significant interruptions in power supply. (Also watch attached Creamer Media video). That impact is not about the inability of Eskom to generate power as takes place during load-shedding, but about the poor standard of maintenance and the unsatisfactory response time following, for example, a lightning strike knocking out a substation. During the latest incidents, Eskom did not have spares available and had to shop around to find transformers, sometimes in distant locations, whereas in the past, the power utility had a ready inventory of spares that could just be loaded on to a truck and taken to stricken areas. “Those are the challenges we see our supplier of electricity is experiencing in maintaining its distribution infrastructure and it might be a while before that’s sorted. But, of course, you don’t have these massive thunder storms every day, you don’t have the impacts on the grid on a daily basis. These are events that take place from time to time and, in order to offset those, you just need to become more resilient in the design of your own risk management infrastructure,” Pretorius commented to Mining Weekly Online. DRDGold, which recovers gold from the retreatment of surface tailings on the East Rand and the West Rand, provides jobs for 2 300 people, including 870 permanent employees. The remaining 1 426 people work for the specialist service providers engaged by the company to provide the expertise required for surface tailings reclamation and tailings dam management. Its Far West Gold Recoveries activity presents far less electricity risk. In its 2018 financial year, it produced 150 423 oz of gold, generated R2 490-million in revenue, spent R1 453-million on capital projects and cleared 191 ha of rehabilitated land for redevelopment. Besides the Ergo plant on the East Rand, it has the new Far West Gold Recoveries on the West Rand. Both areas provide the company with a mineral reserve totalling six-million ounces of gold. Pretorius said that the key drivers of where the business is likely to be in the 12 months to June 30 will be determined by the extent to which it can absorb and navigate its way through the electricity supply impacts on the East Rand. “This is not something we woke up to yesterday, it’s something that’s been in the running for many years,” Pretorius said. In fact, the big Eskom shock happened as long ago as February 2008, when the State electricity utility sent letters to mining companies saying that it could no longer guarantee uninterrupted power supply. Since then, mining companies have been taking steps to reduce consumption and shield themselves from Eskom outages.